As he wrote La casa de Bernarda Alba, Federico Garcia Lorca explained: "drama is poetry that escapes the book and becomes human. And as it is being made it talks and shouts, cries and despairs." Lorca saw in theatre the most perfect means to reach people's souls, more immediate and effective than poetry, and he kindled this possibility even amidst difficult times. Lorca is, mainly, a poet, and as so his plays possess great visual as well as linguistic virtue. The last of the rural tragedies -Bernarda Alba was preceded by Bodas de sangre (1933) and Yerma (1934)- was finished in June 1936. It was meant to open in Buenos Aires in October, played by the Margarita Xirgu company, but Lorca was murdered in July. War events postponed the opening until 1945, but in Spain the play would stay banned until 1964. 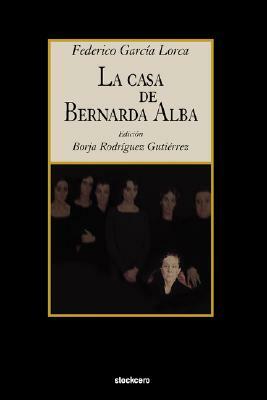 The plot is deceivingly simple: Bernarda Alba exerts a tyrant control upon her daughters, who live as prisoners within her house walls. The conflict is deprivation of freedom, blown up to tragic proportions by the death of Bernarda Alba's second husband and her decision to impose eight years of strict mourning. But this mourning goes far beyond the usual black clothing: during the following eight years no one will leave the house, and no man will enter. The reclusion is the results of them being women of a certain social position. The authority/freedom conflict is visible through the submission of the feminine condition -the subtitle Drama of women in the towns of Spain highlights this-. Freedom is stifled by the prejudices of a social class enslaved by appearance and tortured afraid by gossip. Lorca's theatrical experience is highly noticeable in his way of highlighting the conflict without superfluous details: lighting, costumes, text and language, and the actresses' movements, everything is measured to the last millimeter. And the closing words of the main character become a remarkable premonition of what would shroud Spain during many following years. "And I do not want sobbing. Death must be stared in her face." "Silence, silence I have said Silence Professor Borja Rodriguez-Gutierrez adds to this edition a clear introductory essay that dismantles Garcia Lorca's clockwork mechanism, while introducing annotations that allow the reader to fully grasp the meaning of this influential cornerstone of Hispanic letters.